Hi guys! Thank you for stopping by. Last week I shared how I was cleansing/detoxing in this post. Today I want to share with you what I will be adding to this week. You simply take a natural bristle brush and gently brush it in a circular motion over your skin. This stimulates collagen production, boosts circulation and massages the skin which triggers drainage of your lymphatic system. It also exfoliates which gives a nice glow to you skin and eliminates ingrown hairs. The greens are alkaline, cleansing and contain antioxidants which also neutralize unpaired electrons that cause oxidative stress in the body. This stress leads to toxin build up and aging. When you are consuming greens in a smoothie the cell wall of the greens are broken down. This not only gives your digestive system a break in the morning but makes it easier for your body to assimilate the nutrients in the greens. Toxins are stored in our fat cells and the result is the dimply skin we call cellulite. When we jump on our rebounder we are jarring these toxins, drinking the cran-water aids in flushing toxins out. The flavonoids, enzym es and organic acids found in cranberries emulsify fatty globules and effectively reduce the appearance of cellulite. Cranberries strengthen connective tissues and neutralize free radicals due to their high level of antioxidants. Make this a part of your daily routine and over time your body's PH will change resulting in smoother skin and a healthier body. Epsom salts contain sulfates which are a detoxifier. The magnesium is a relaxant and digestive aid. I love to soak in a hot detox bath at least 3 times a week. I add a few drops of essential oils like lavender to enhance the experience. This is what I am doing to try and get my skin and body ready for summer! I will also try to do 90 counter push ups per day as well and throw in a few crunches. As you can see, the cran-water is key. I am sure you are gathering how much I love it. It is super tart if you aren't used to 100% cranberry juice but I absolutely love it! 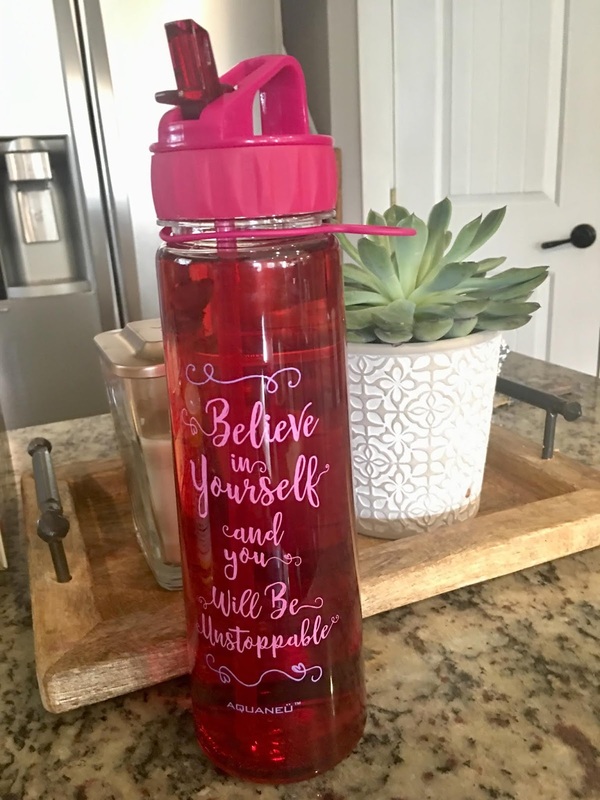 My SIL's mom, who we all affectionately call Mimi, gave me this water bottle last week. It makes it so easy to get my daily water intake in. The times of day are marked on the bottle as a reminder. She said it is better for your pancreas when you sip water in increments. I bought my oldest daughter this one and it should be here today! I hope everyone has a wonderful week and if you try any of these I would love to know in the comments down below. Praying for all of my readers today. A Little Peek Into Our Family.